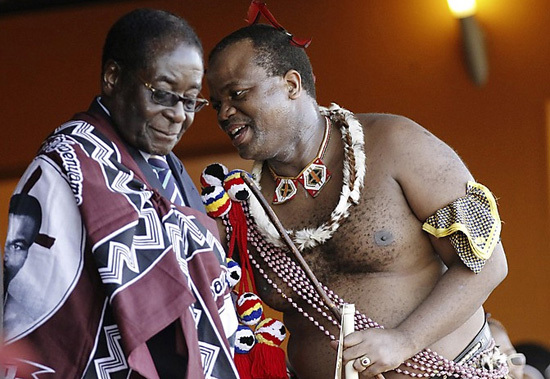 ZIMBABWE and Swaziland have emerged as the most un-free African countries on a range of democracy indices such as freedom of expression, liberty to join any political association and voting for a candidate of their choosing. The latest Afrobarometer survey says 51 percent of citizens surveyed in 28 African countries believed their country was a full democracy, or one with just a few problems. Of the 51 percent of respondents who expressed satisfaction with the country’s democracy, 18 percent believed they lived in a full democracy, and 34 percent in a democracy with some challenges. In 10 of the 28 countries, those surveyed believed they didn’t live in a democracy or a democracy with major problems. Full or fair satisfaction with democracy declined from 50 percent to 46 percent on average since the last survey, in 2011. Released before Tuesday’s International Day of Democracy, the Afrobarometer survey is based on 41 953 face-to-face interviews in 28 African countries, excluding South Africa, since June last year. Afrobarometer regularly conducts public attitude surveys on democracy, governance, economic conditions and related issues across the continent. “The perceptions of ordinary citizens provide an important window on progress and remaining challenges,” Afrobarometer says in relation to on-going work to fully implement the AU Charter on Democracy, Elections and Governance, committing governments to human rights, democratic principles, representative governance and free and fair elections. In the recent survey, democratic satisfaction dropped markedly by between 18 percent and 21 percent in Lesotho, Liberia, Tanzania, Ghana, Benin and Cape Verde. However, Namibia is bucking the trend, as satisfaction levels jumped up 10 percent, as satisfied respondents in Tunisia increased by 19 percent, 16 percent in Mali, and satisfaction is up by a handful of percentage points in Togo and Ivory Coast. Swaziland and Zimbabwe emerged as the most disappointing. In Swaziland, 59 percent of respondents believe they are not free to express themselves, followed by 20 percent who believe they are “somewhat free” and 18 percent who believe they are completely free. In Zimbabwe, 43 percent do not believe they have full freedom of expression, with another 30 percent believing they are somewhat free to express themselves freely. In Swaziland, 73 percent of respondents said they weren’t free to join a political association, as did 41 percent of Zimbabwean respondents. Zimbabwe also tops the list of countries with the least number of citizens who believe they have the freedom to vote for a candidate of their choice – only 35 percent of Zimbabweans believe this – with Swaziland in fifth place (56 percent). In contrast, 94 percent of Malawians believe they are completely free to vote for their candidate of their choice, as do 89 percent in Senegal and Tunisia, 86 percent in Sierra Leone and 85 percent in Ghana, Uganda, Namibia and Botswana. Only 2 percent of people in Tanzania believed they weren’t free to join political associations of their choice, as did 4 percent in Botswana. In Namibia and Tanzania, 70 percent of respondents believe they are completely free to express themselves, as do 73 percent of Ghanaians and 65 percent of respondents in Botswana. The Afrobarometer survey says on average across all the 28 African countries, 51 percent believe they are completely free to express themselves and another 26 percent feel they are somewhat free. Indicators regarding freedom of political association were more robust: on average, 62 percent felt completely free to join political associations. This article is from The Star.